← FUTURE FOODS: 3D PRINTING FOR THE KITCHEN? In the “last days,” during the days of the Antichrist (Rev. 13), there will be the creation of an “image” of the antichrist which will deceive the world by way of its perfection as a replica. In today’s advanced technology, this replica can be both robotic and virtual. On this page, we will show evidence of this technology and its evolution to perfection. What this means is that the nextgen computers will have the ability to not only learn from errors, but, as a result, change their minds as humans do. Digitally “teleporting” living individuals from one fixed location to a remote location, giving the sensation that the individual is actually at the remote location. The images shown here look like photographs or portrait prints. But, they are not. They are software creations! We are available to bring this presentation of The Revelation File News Forum with Wally Wood to your church or special group gathering. Simply contact us through this website. Featured here is the event flyer for this particular presentation. 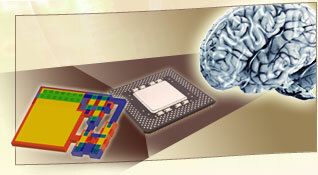 This entry was posted in Advancing Technology, Image Technology and tagged brain, Brains, chips, computer, computers, human-like, image tech, image technology. Bookmark the permalink.